The original KazSat spacecraft was developed by Khrunichev enterprise in accordance with the agreement reached by Russian president Vladimir Putin during his visit to Kazakhstan in January 2004. A formal agreement between Kazakh and Russian governments on the mission was signed on January 18, 2005. The project reportedly cost the Kazakh government between $65 and 100 million, according to different sources. However the Express was apparently unavailable, leading to a major change in the flight scenario and a series of delays. The KazSat was rescheduled to February, March, May and June 8, 2006, and would ultimately fly alone onboard its own Proton rocket with Block DM-3 upper stage. The spacecraft, featuring unpressurized platform, carries 12 Ku-band transponders with the total weight of about 180 kilograms, which would provide TV, data transmissions and other communications services across Kazakhstan, Central Asia and central regions of Russia. The electrical testing of the spacecraft started at Khrunichev enterprise on February 7, 2006. The spacecraft was delivered to Baikonur by An-124 Ruslan Aircraft on April 28, 2006. The spacecraft was powered up for electrical checking at the launch site on May 4, 2006. On May 25, the satellite's propulsion system was fueled with xenon and on May 29 it was covered with payload fairing. The satellite and its upper stage was then integrated with the payload fairing on June 10, 2006. The launch vehicle was rolled to the launch pad on June 14, 2006. Less than four months after its latest failure, the Proton rocket resumed its missions with apparently successful launch of the first satellite for the government of Kazakhstan. The Proton-K rocket with Block DM-3 upper stage blasted off from Pad 39 at Site 200 at Baikonur Cosmodrome on June 18, 2006, at 01:44:05.003 Moscow Decree Time, (02:44 Moscow Summer Time, 04:44 local time) carrying the KazSat communications satellite. The upper stage and its payload separated from the third stage 9 minutes 28 seconds after launch. Following a successful orbital insertion, the payload separated from the upper stage at 08:32:33.626 Moscow Decree Time (09:32 Moscow Summer Time), according to Khrunichev enterprise, which developed the spacecraft and the launch vehicle. In a rare appearance in Baikonur, Presidents of Russia and Kazakhstan personally watched the launch accompanied by the head of the Russian space agency, Roskosmos Anatoly Perminov. Despite unofficial reports about problems after launch, official statements from the Russian space agency, Roskosmos, said that the spacecraft reached its nominal orbit and all elements on the vehicle were successfully deployed. As of June 19, 2006, ground controllers were preparing for the transfer of the satellite into its operational position in the geostationary orbit. The engine firing to change the latitude of the geostationary orbit was conducted on July 7, 2006. On July 25, 2006, Roskosmos announced that KazSat had been in the operational orbit at 103 degrees Eastern longitude over the Equator. On August 8, 2006, ground controllers from Khrunichev enterprise deployed in Kazakhstan initiated final tests of the satellite, according to Roskosmos. Khrunichev's team was scheduled to remain at the Akkol control site until August 18, 2006. On September 6, 2006, spokesman for Kazakhstan's information and communication agency told Kazakhstan Today that all Kazakh communications providers were switching to the KazSat satellite. He also said that former Soviet republics of Uzbekistan, Kyrgyzstan and Azerbaijan requested the use of the satellite's available capacity. Until the fall of 2007, the satellite was handled by the Russian ground control station in Skolkovo, after, which Kazakh specialists at the Akkol station in Kazakhstan took over the operations. Skolkovo station retained a backup functions, according to Roskosmos. On June 10, 2008, Russian space agency, Roskosmos, reported that the Kazsat satellite had developed problems in its flight control system two days earlier and Russian specialists at the Skolkovo ground control station worked to resolve the issue. 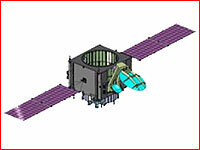 Kazakhstan Today agency reported that due to the problem with the onboard computer on June 8, 2008 at 07:00 Moscow Time, the satellite ceased its broadcasting functions. It was reportedly a second problem with the satellite, after another technical glitch on April 17, 2008, which was resolved by specialists from Khrunichev enterprise. Only on October 30, 2008, Khrunichev announced that the problem with the satellite had been resolved and it had been returned to its proper orbital position during that month. Khrunichev promised to return the satellite to normal operation after a series of tests. On November 26, 2008, ground controllers lost contact with Kazsat-1 and despite all efforts to revive the spacecraft, it was declared a total loss as a result of the failure in the Complex of Control Engine Wheels, KUDM. Russia made a second bid to deliver the 21st century satellite communications to its neighbor Kazakhstan, with a space launch from the territory of this former republic within the Soviet Union. A Proton rocket with the Briz-M upper stage lifted off as scheduled from Baikonur Cosmodrome's Site 200 on July 16, 2011, at 03:16 Moscow Time. It was carrying a pair of communications satellites: KazSat-2 for the government of Kazakhstan and the SES-3 (formerly OS-2) for the SES satellite operator. A second satellite in the KazSat series had been planned since the inception of the program as a complement to the original spacecraft, however in the wake of its predecessor failure, the second vehicle had to become a replacement. On September 29, 2006, Roskosmos announced that Khrunichev enterprise won a tender of the Kazakh government for the development of the KazSat-2 spacecraft, then scheduled for launch in November 2009. Among contractors in the project were also named RNII KP, FGUP Kosmicheskaya Svyaz and Alcatel Alenia Space. The project was estimated at $115 million, according to Kazakh officials. 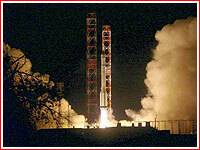 By the time of the Kazsat-1 failure in November 2008, more than 60 percent of the manufacturing work on the Kazsat-2 had been completed, according to the Interfax news agency. The mission however slipped to the end of 2010. On Feb. 10, 2010, International Launch Services announced that KazSat-2 was "paired" with the SES-3 communications satellite for its ride to orbit on the Proton rocket scheduled for launch in 2011. Soon after the failure of the Briz-KM upper stage to deliver the Geo-IK–2 satellite into its proper orbit on February 1, reports surfaced that the launch of KazSat-2 would be delayed to May 2011, even though the postponement was attributed to the delay with the completion of the satellite. The Proton rocket intended for the KazSat-2 mission would use the Briz-M upper stage, similar to the Briz-KM vehicle, which was blamed for the Geo-IK-2 launch failure. In the second half of May 2011, the KazSat-2 mission was planned for the middle of July 2011. At the time, the final approval for the launch of KazSat-2 was expected soon, with the delivery of the satellite to the launch site promised by the end of that month. On June 20, 2011, during the Paris Air and Space Show in Le Bourget the Kazakh center for satellite communications signed an agreement with Russia's ISS Reshetnev to build the KazSat-3 satellite. 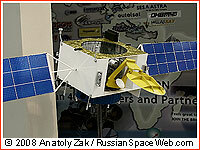 This time, the spacecraft would be based on Ekspress-1000N platform developed at ISS Reshetnev. The satellite, then slated for launch in 2013 into an orbital position at 58.5 degrees East longitude, was promised to work for 15 years. It would feature 28 Ku-band transponders and provide 5.5 kilowatt of power for its payloads. A European consortium Thales Alenia Space was subcontracted to provide the communications system and the command and measuring system for the KazSat-3 project.